Consequently, they spent a day covering “the entire lake” probing for areas holding fish and what they would bite. “We threw the kitchen sink at them,” added Farver. “I mean everything: jigs, tubes, crankbaits, square bills, curly tail worms, senkos, topwater, everything. But the only thing that produced were tubes and jigs.” They also concluded, “We believe the northern pike outnumber the bass 3 to 1 here!” During that day, few places produced quality fish. But one spot did produce a 3.5 pound smallmouth, and another spot 500 feet away yielded a few additional keepers. 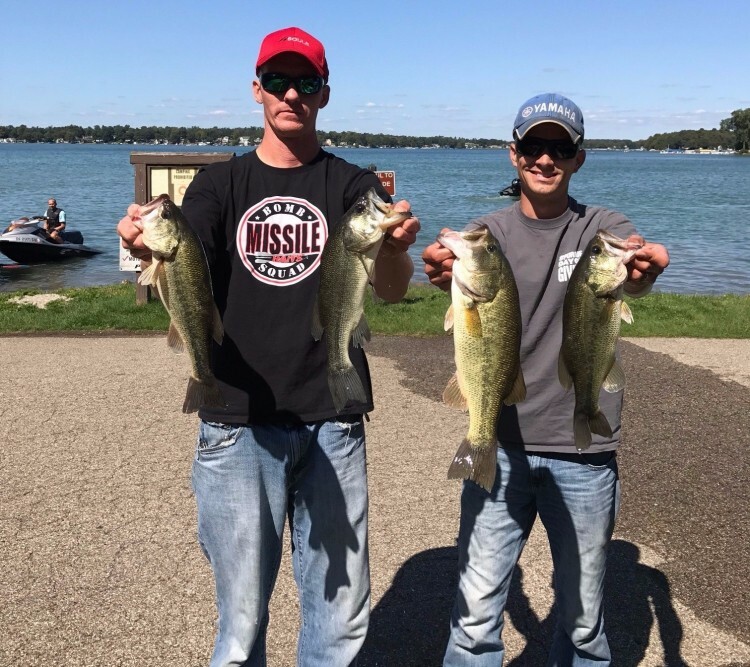 Hoping for an early limit, they began the tournament on the spot that produced multiple fish, but after an hour, they had nothing. Strategically, they worked towards the spot that produced the smallmouth, and after working closer, Kline commented, “Our shadows are out in front of us.” Fearing their shadows were spooking the fish, he slung his jig as far as he could past the shadows and immediately caught the Native Pride Tackle Big Bass (a hefty 4.77 pound largemouth), almost exactly on the same spot at the smallmouth in practice. While it was incredible to land this for their first fish, the bite did not improve. Despite covering lots of water, at 11:00 they still were stuck on one bass. This is when they returned to their starting spot, “We knew they would turn on eventually,” and he was right. Upon returning, they pieced together their limit using jigs and tubes. 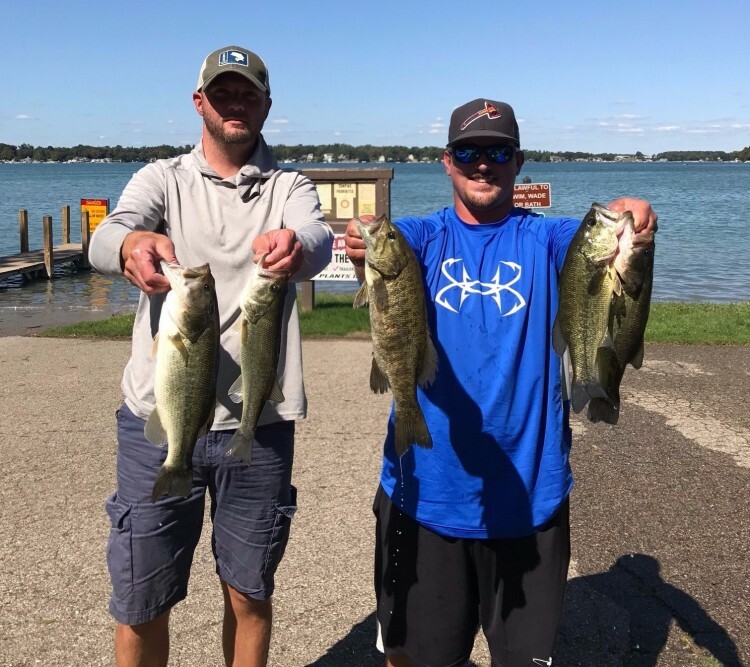 ​​After logging 2 victories (Maggies), 6th at Wawasee, 5th at Winona, 4th at Austin, and 13th at Eagle & Juno Lakes, Farver and Kline came from behind to become the 2017 R & B Bass Circuit West Division Season Champions. Their 281.05 points is the third highest total in R & B History. 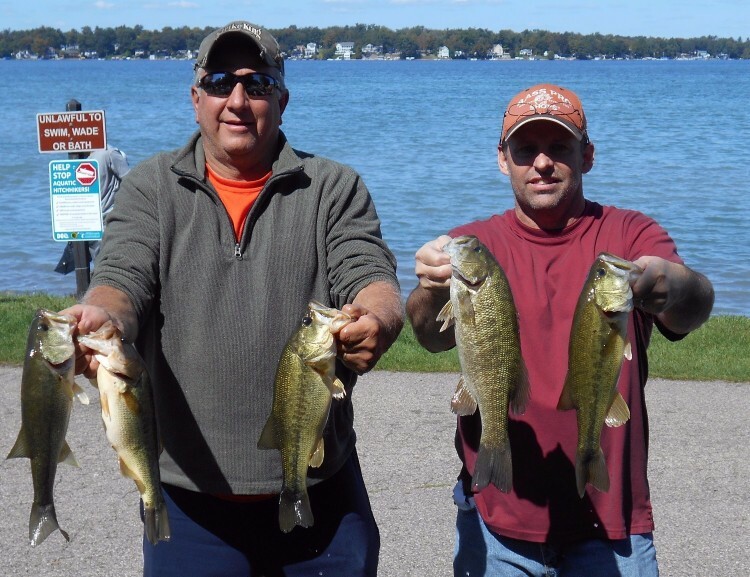 Money and plaques await them at the Megaware KeelGuard Classic at Houghton Lake. ​​Click HERE for the Results! 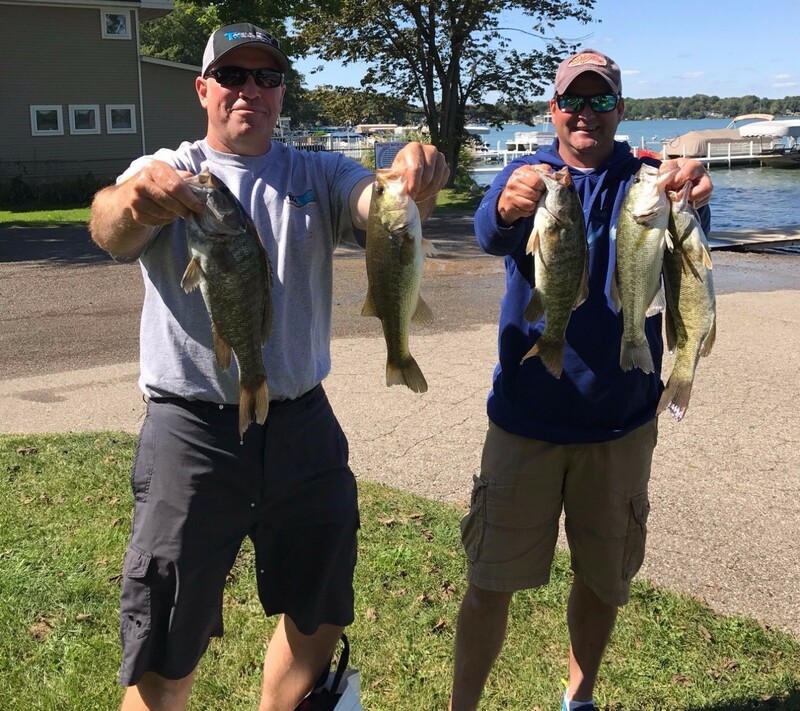 2nd Place: Tom Noe & John Gipson, Jr.
How it Happened: No team deserves the title of “ringer” on Diamond Lake than these two. Gipson readily admits he has won more tournaments on Diamond than any other body of water. First, they began with topwater in shallow water, but after failing to trigger a strike in two hours they slung drop shot rigs in 20 feet of water where they plucked two keepers. After 90 minutes they moved up to the 6-8 foot range with tubes and caught two more keepers. 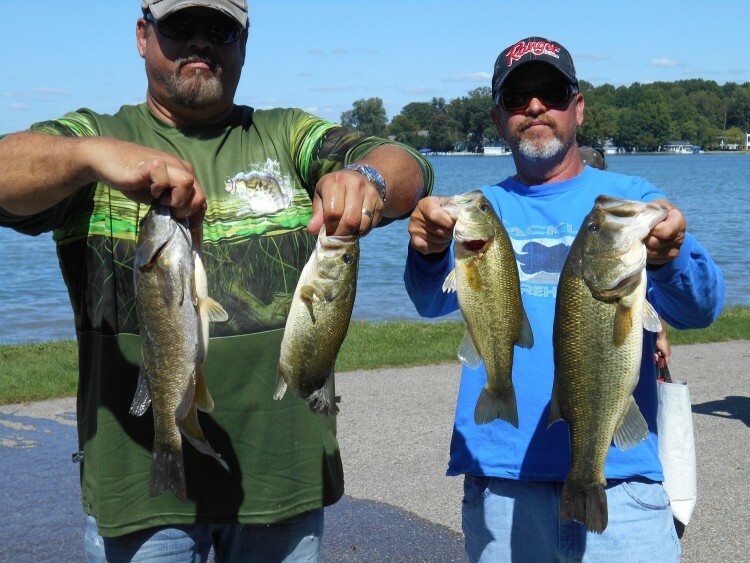 Finally, at noon they returned to the banks and caught the second biggest bass of the tournament with a jig from under a dock. For the remainder of the day they worked the jerkbaits with various retrieves. By 11:00 they had their limit and spent time looking for similar areas, but were not able to cull. two keepers in the first 30 minutes and had another pair an hour later. They finished their limit at noon as they rotated between two areas and culled two times. Retrieval was important as they worked the baits especially fast to get their bait 8-10 feet deep. They tie their jerkbaits to a fluorocarbon leader that is attached to 10 pound braid line. How it Happened: Paulus is quick to admit it was a painfully slow bite, but taking the time to target both species paid off. 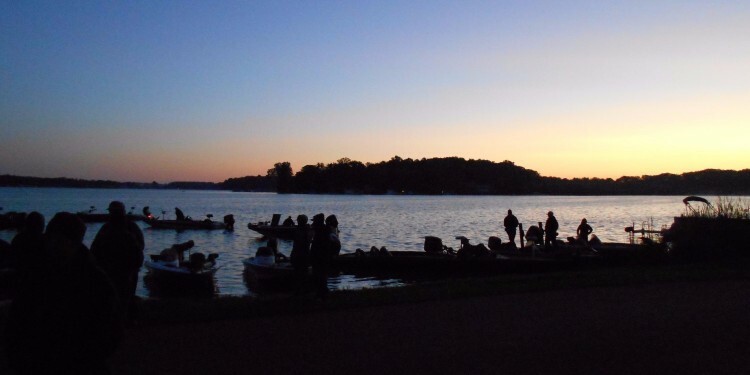 In totality, they caught 4 keeper smallmouth, which all fell victim to the swimbait, and 3 keeper largemouth that were fooled by the B & N Custom Baits darter. It took nearly two hours to get their first keeper, but as the day wore on the bite got better.